Years of consideration, discussion and controversy came to a head at Leamington Town Hall on Wednesday night when the Local Plan for Warwick District Council was finally adopted into the area’s planning policy. The plan includes 13,000 new homes to be built across the area by 2029, which will make up a total of 16,776 taking into account projects which have already started or have been completed since 2011. Of this total, 5,000 of the homes will be affordable - defined by Government as houses with mortgage repayments below the local market value. Almost all those councillors who were at the meeting voted in favour of adopting the modified plan with only a few abstentions and none against. Before this, councillors heard from some of those objecting to the plan. Peter Langley of the Campaign to Protect Rural England (CPRE) said the campaign had been trying to secure “a more realistic, balanced and environmentally sensitive Local Plan”. He added: “We believe the present plan is none of those things because it treats housing and employment growth as more or less the be all and end all. “The villains of the piece are two-year-old memoranda of understanding on housing and employment based on dubious assumptions. “Once they were signed behind closed doors by the Coventry and Warwickshire authorities without public consultation or a sustainability appraisal, officers were able to ignore any counter views. The CPRE is part of a consortium under the banner of Keep Our Green Belt Green - also made up of parish councils and residents’ groups - which is planning a legal challenge against the Local Plan. 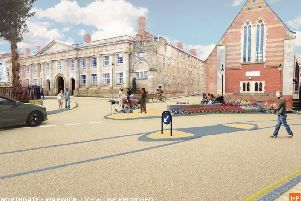 Before councillors had their say on the pros and cons of the plan, the council’s chief executive Chris Elliott warned them that they would have to make a ‘binding choice’ of whether to adopt it or not. He likened the current stage of the plan to “a game of snakes and ladders with all the ladders removed” where refusal to approve the plan would cause the process to “slide right back to the start”. Most councillors who spoke expressed sympathy for those living in areas near and where many new houses would be built but stressed the need to have the plan in place to prevent developers making speculative applications across the district. Speaking after the meeting, council leader Cllr Andrew Mobbs said: “I’m delighted the Local Plan has been approved. This means we have control over development in our district for the next 12 years. “It will provide employment sites and, of course, sites for new homes. But we can also deliver a balanced local housing market. “It’s my wish that people who work here can also live here and that their children and grandchildren can do the same. So we will deliver affordable housing. *The Local Plan could help those who are struggling to buy a home in the Warwick District Council area to finally get on the property ladder. This is the view of Warwick district councillor Andrew Thompson who spoke at the meeting at Leamington Town Hall on Wednesday at which he and fellow councillors voted by a large majority to adopt the plan into the council’s planning policy. Speaking at the meeting Cllr Thompson (Con, Newbold), who is one of only two council members who is under the age of 30 and is currently renting a property, said: “The prospects of me buying my own house any time soon are very slim and the worrying thing is I’m not unique in this - many people of my age are in the same boat. “Housing is the biggest problem facing my generation, with living standards regressing and many children of the 90s having horror stories about bad landlords. “Growing house prices are making owning a home unaffordable for many and this also pushes up the rental prices. “We all know what a great place Warwick District is and it makes it more attractive for people to live and work here as the economy continues to grow. “We have a sizeable number of people in the rental market and families with kids in schools who will be in their twenties during the lifetime of this Local Plan. This all leads us to the basic rule of supply and demand and demand is much greater than our supply. “Currently we do not have enough houses for millennials or those trapped in the rental market.